Each year the members of the Archdiocesan Council of Catholic Women organize the Priest Burse Club. Through their dedicated efforts parishioners throughout our Archdiocese are given the opportunity to support the education of our seminarians by becoming members of the Priest Burse Club. This "Club" has no meetings. By contributing the minimal dues of one dollar a month or $12 a year a member contributes to making certain that future generations of Florida Catholics will have the ministry of devoted priests. Extraordinary Ministers of the Holy Communion are privileged to serve as Ministers of the Body and Blood as needed by the parish. Candidates wishing to participate in this most holy ministry of sharing the Body and Blood of Christ with their fellow worshipers are approved in advance and trained before commissioning and scheduling. Extraordinary Ministers of the Eucharist bring communion to fellow parishioners who are sick, in nursing homes, assisted living facilities, in the hospital, or home bound and are unable to join in the celebration of Mass. For additional information, contact the parish office at 850 234-3266. Through Charity, Unity, Fraternity and Patriotism, Catholic men aged 18 and older support activities in the parish, community, and the Counsel. Membership is open to all Catholic men who live up to the Commandments of God and the Precepts of the Church in union with the Holy See. The Knights of Columbus meet every third Thursday of the month in the St. Bernadette Parish Hall at 6pm. The St Bernadette Ladies Guild was formed in the 1970's. 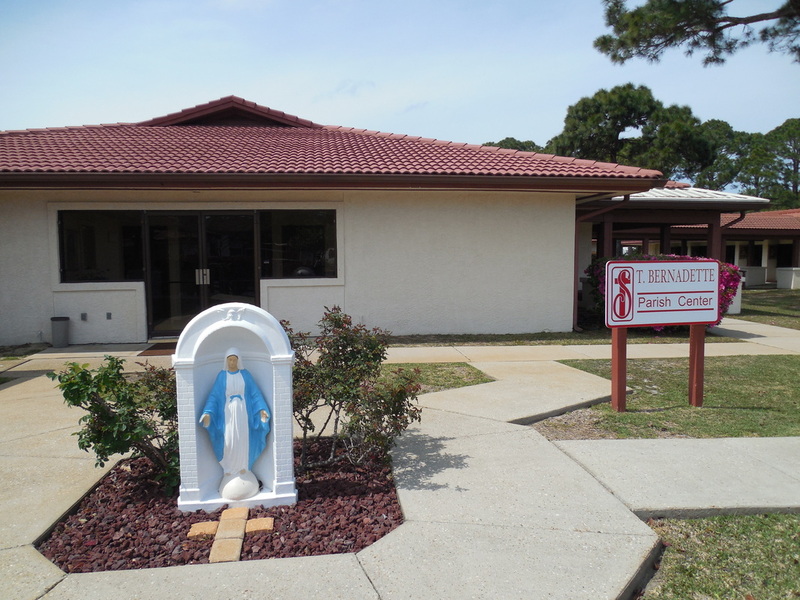 The purpose of the Ladies Guild is to help support and promote St Bernadette Catholic Church spiritually, financially, and socially, and is open to all women in the parish. Meetings are the first Friday of each month following the 8:00 am Mass in the Parish Hall. The Ladies Guild supports the Parish in the following ways: Bereavement Support, Altar Society, hosting Church dinners and an annual silent auction, religious article sales, church decorating for Christmas and Easter, and volunteering at the John Lee Outreach Center. The parish pastoral council continuously develops and articulates a deep and mature understanding of the identity and purpose of the parish. It reflects the unique personality of the parish as it evolves, using the mission statement developed by the pastor and parishioners. The pastor and the parish pastoral council strive to ensure that the parish is carrying out its stated mission and the pastoral needs of the parish are met. These include Word, Worship, Community and Service. The pastor and council enable and encourage the broadest participation of parishioners in evangelizing, both within the parish and the larger community. It accepts the responsibility of hearing all voices in seeking to discern the will of God in the local community using scripture and the voice of the Church as their guide.Because parishes are dynamic communities, flexibility is essential in the ministry of the parish pastoral council. Flexibility means “openness to all present reality.” People change, council membership changes, staffs change, ministries change, and the larger community changes. •The personality and style of the pastor, members of the council, the parish staff, and other parish leaders. •The ministries that are in place. •The uniqueness of the parish. The St Bernadette Parish Council meets on a Tuesday every quarter. The meeting starts at 5:00 pm in the Parish Hall. All members of the parish are invited to attend and participate. Meeting dates are posted in the bulletin. The finance committee is a group of parishioners that advises the Pastor on financial matters for the Parish. This group meets to review quarterly statements and to plan the yearly budget. Members are appointed by the Pastor and typically serve on the committee for three years.